In the Twin Cities, homes old and new are works in progress. Homeowners are constantly thinking about making improvements and changes in their homes. As families change and situations change, people constantly adapt their homes to those changes. From simple projects that add a desirable new feature or change to complete remodeling of rooms and the layout of a home, changes bring new life to any home. At our full-service handyman company, we’re constantly getting requests for assistance in making homeowners’ ideas become reality. Our network of professionals in the building trades includes skilled carpenters, woodworkers, and craftsmen in all trades. Bring us your ideas and we’ll match them with qualified partners, talented people who can make them happen. Just about any change in your home, from the simplest project to the largest remodeling job starts with the basic structure of your home, and that means bringing carpenters to the job. 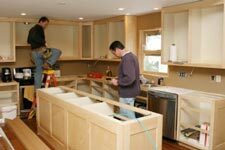 In most cases, the skilled, creative carpenters in the in our home service network also have highly developed skills in all phases of construction, and can complete many projects from beginning to end. Kitchen Remodeling – Make your kitchen unique with new cabinets, flooring, islands, and built-in appliances to suit your own ideas. Bath Remodeling – Turn your boring, tired old bath into a luxurious space with tile flooring, an exotic spa or walk-in shower, and modern fixtures. Basement Remodeling – Increase living space with egress windows, basement finishing, ceilings, basement baths, family rooms, and home office spaces. Bedroom Remodeling – Create a welcoming master bedroom with a new attached bath, expanded closets, luxurious flooring and built-in features. Family Room Remodeling – Turn your family room in to a home entertainment theater, friendly pub, or recreation center. Your imagination is the only limit. Accessibility Remodeling – Customize your home to accommodate the limitations of residents. Ramps, railings, safety bars, and wider doors are key. Any Remodeling Project You Can Imagine – Think of your home as a blank canvas, and then make it uniquely your own. Let our home remodelers help. If you’re like most homeowners, you’re always thinking about ways you could improve your home and make it an ideal place for you and your family. At our Twin Cities handyman service company, we’ve helped homeowners throughout the Minneapolis St. Paul metro area realize those ideas. Our network of building trade specialists have the creativity and skills to turn whatever you can dream into reality. Call us soon to discuss your ideas, and we’ll match talented craft workers to your project. We’d love to help.